First, I tried to steal it, but they caught me. Finally, I just had to buy it... and I couldn't be happier I did. What could be so important that I would try to run off with the publisher's only copy at ComicCon, potentially leaving my friends with nothing to exhibit? Nothing short of my favorite Star Wars book release since 1996's Shadows of the Empire. The book is Star Wars: The Blueprints by J.W. Rinzler. It's the king of all Star Wars non-fiction in both size and content... and it has a price to match. But if you can stomach the list price (or find a sweet deal), it's worth every penny. This book is exactly what you might expect from the title - blueprints. 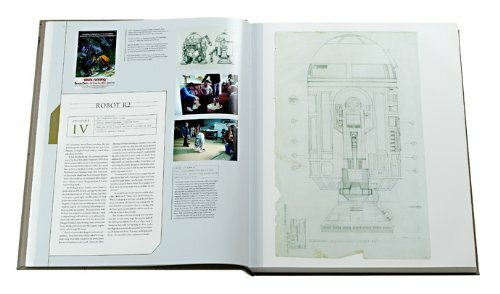 Every page is packed with the actual production blueprints used to build sets, vehicles, props, and robots from A Galaxy Far, Far Away. Their industrial-detail requires a format to do them justice and the size of this book delivers a very rich and detailed look at the prints. The first thing that hits you when you open it up is the sheer heft and size of the volume (editors note: the following year, my movers commented multiple times that it was the largest book they had ever seen). Part of the heft is due to the incredible quality in both binding, paper, and even the protective case it comes wrapped in. I've never owned a book that felt like it belonged in a museum until today. If you've read Rinzler's previous making-of works, you will find the content of Star Wars: The Blueprints comfortably familiar. The history and interviews have great depth and provide a look at Star Wars that is almost entirely unknown. Rinzler succeeds in making heroes out of the production designers and draftsmen who made the universe we love - a long overdue dose of the spotlight for a team of incredibly talented individuals. If there is one downside to a museum-quality large format archive of that gives an in-depth look at the blueprints spanning the entire saga, it's the price tag. The Blueprints is not for the fair weather fanboy with a $500 cover price. But for dedicated fans and prop builders, I think this is one worth saving your nickels. In fact, Amazon sells the book for $50 off.